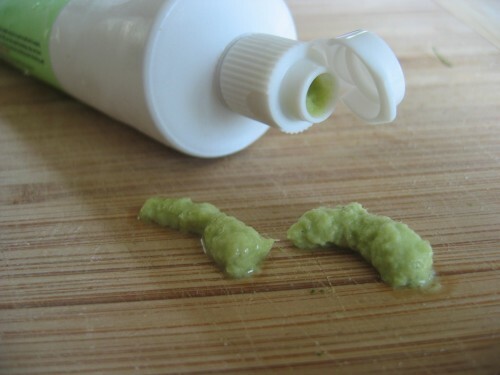 Following up on our recent sushi article, here’s a picture of some real wasabi paste, rather than the green dyed horseradish stuff that you get in sushi restaurants. These wasabi tubes were purchased from Pacific Farms, a company based in Florence Oregon that until recently, grew their own wasabi. The website is somewhat vague about where their obtain their wasabi now, but they were one of the few (if only) commercial growers of wasabi in the US. From the picture, you can see the texture is more chunky with fibrous root material. The green is more of a pastel shade and less tennis ball green that you get in restaurants. The taste is immediately discernible, as there is a subtle, yet sweet flavor. The “kick’ that wasabi is known for is more powerful as well, though in a dull and prolonged manner versus the sharp, eye-watering kick of horse radish. In reality though, real wasabi paste is more of a novelty if you aren’t making your own sushi, as you’ll be hard pressed to take your own tube of wasabi into a sushi restaurant without looking quite odd. In addition, real wasabi only keeps fresh for so long before spoiling, so you either need to use it quite quickly in the refrigerator or keep it in the freezer for storage. Nonetheless, it was a fun lesson in learning what real wasabi tastes like. You might be able to get real wasabi in high end restaurants outside of Seattle, but we don’t know any Seattle restaurants that actually offer this, due to the price and extremely low demand. For our blog readers and RSS guys, I wanted to make a quick post to let you know that we have two recent articles posted on the website. The first is titled 7 Quick Tips to Become a Sushi Snob and the second is an interview with Laughing Buddha beer, a local asian inspired microbrew. The beer article was inspired from our summer trip to the beer festival at St. Edwards State Park, across from Bastyr University in Juanita. We were lucky enough to grab a few quick tastes before their line stretched nearly 50 people long past the other local brewers. They had some flavors that complimented well for a hot sunny day, with mango and ginger flavors. There were a lot of fruit styled beers that day, such as blueberry and peach, but I actually found the taste rather off-putting. There was an Aprihops beer from Dogfish Head that I was smiling over as well. More interesting, the sushi write-up was more of an ad-hoc diversion, due in part to a review that I read of Mashiko’s on Citysearch. The gist was that Mashiko’s was given a one-star review from a reviewer who complained that the sushi was worse than Sushiland, the spicy tuna rolls were lacking and that the service was slow. Reading over the review, it occurred to me that lots of self-proclaimed sushi snobs aren’t exactly well versed on their, well, snobbery. So, I felt I had to address something and write a better guide on how to act like the know-it all sushi snob instead. Of course, the previous statement is a bit tongue in cheek, but there are good points in the article that any sushi lover can benefit from – so check it out. Inspecting my hatchet job of the innocent sushi rolls above, I may just be a little more humbled the next time I see some perfectly cut sushi at a Japanese restaurant. 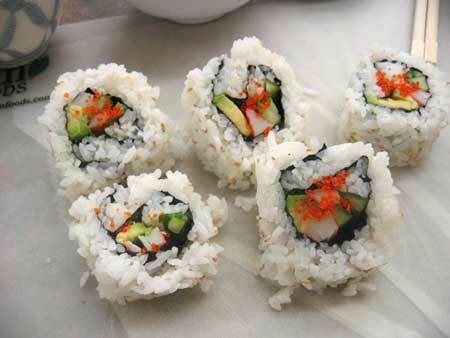 Luckily, our sushi teacher Naomi from NuCulinary, was far more lenient of my aesthetically challenged California rolls, given that it was an introductory sushi class. NuCulinary is a Seattle based Asian cooking school that offers classes for Thai cooking, Indian, dim sum as well as sushi classes of various skill levels. While I’ve eaten plenty of sushi in my life, I thought it would be neat to gain more knowledge of the skill and art that is sushi. Today was part one (basic sushi rolling) out of a three part series that culminates in learning the art of nigiri directly from chef Hajime Sato of Mashiko in West Seattle. Each class is $65 and lasts for 3 hours, which is a fairly reasonable deal as far as cooking classes go. Not having rolled sushi before, everything being shown to me was going to be brand spanking new. I learned the proper way of making sushi rice (always important), selecting the right nori (seaweed sheets), ingredients to use and of course, how to roll sushi. As you’ve already seen though, even with years of Playdoh experience behind my fingertips, it’s not quite as simple as simply tossing ingredients on a bamboo mat and rolling it into circles. But, the good news is that looks aside, sushi is easy enough that anyone who can follow a recipe can easily pick up sushi rolling as well. As for nigiri, well, that’s a totally different story unless you happen to be accustomed to gutting and filleting 30 pound fish (and even then, that’s still a stretch!). Some interesting tidbits I learned about proper sushi etiquette that I’ve heard before, but never “officially” until now, is the right way to eat your sushi. Apparently, the common American tradition of drowning those poor sushi rolls in vats of soy sauce is a serious faux pas to a genuine sushi chef. To the chef, this signals that the sushi apparently isn’t good enough on it’s own that it needs to be marinated in salt in order to be consumed. So just like you wouldn’t put A1 on your filet mignon at The Metropolitain, hold the soy to a minimum when possible. To impress your sushi chef, use those fresh and ample slices of ginger to soak up the liquid, then dab your rolls with the sauce to show that you know the fine line of moderation. Another way to become part of the sushi elite is to hold off on the wasabi as well. This might not make sense, given that you are always offered a large green dollop with your sushi, but sushi purists only use as much wasabi as the chef has already put into the dish. 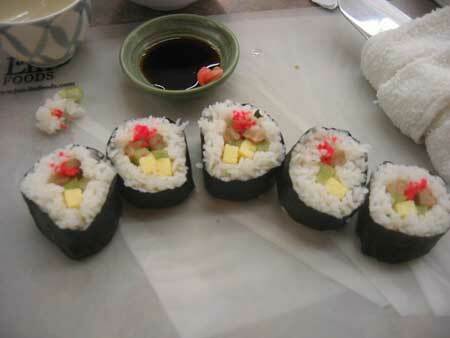 Normally, there is just enough wasabi to help glue the fish to the rice, which avoids any overkill of wasabi flavoring. So in a nutshell – trust your chef and you’ll gain his/her respect. If you haven’t rolled sushi before, it’s definitely good fun, so give it a shot either through a class like this one or pick up one of the many books on the subject. At the very least, it will give you a much better appreciation of your sushi chef when you’re sitting at the bar eating omakase (prix fix) style!